One of the best things about summers at StoneGable are the outdoor spaces! We love to spend summer evening in the garden and back porch and patio. Now I have a new favorite place to spend long summer evenings! Bobby and I have been very busy lately rearranging the landscaping to make room for my potting bench and a quaint kitchen herb garden. And I’m thrilled that I have a space to putter and plant and clip herbs and listen to the birds… right off my back porch! This is a part of StoneGable I have never shown before. 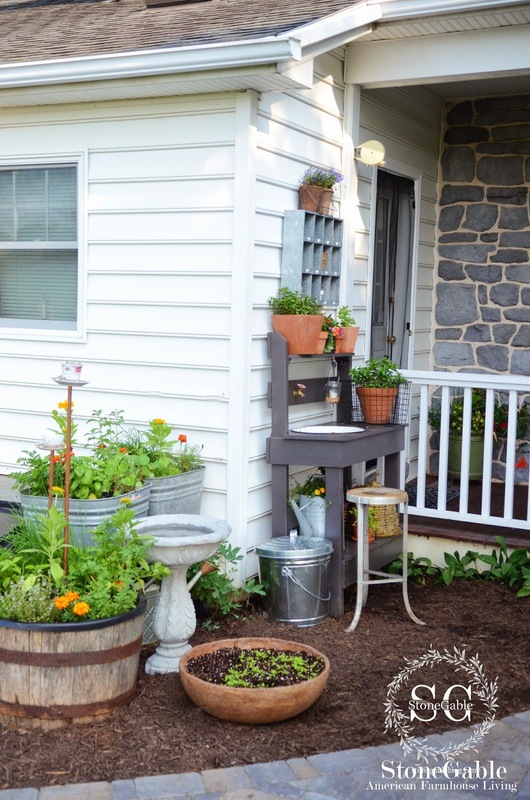 The potting bench is tucked in a little corner of StoneGable at the end of our wrap around porch near the laundry room door and just steps from the kitchen door. 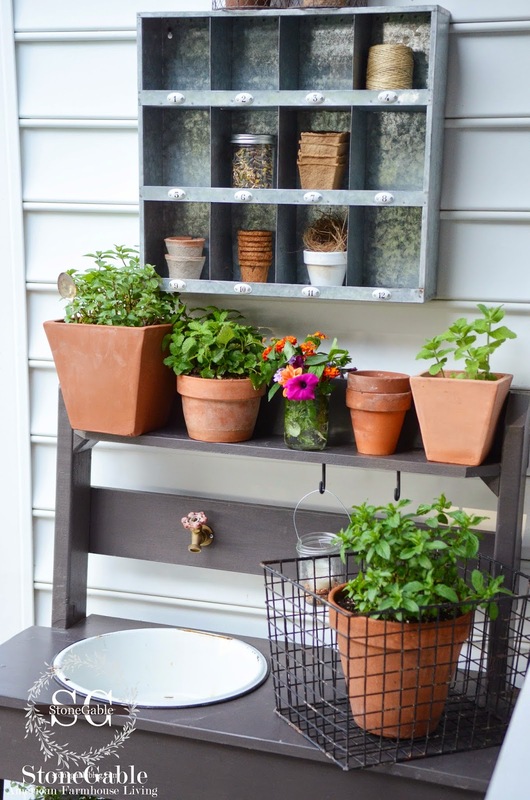 It was not only a great place to put the potting bench, but my kitchen herb garden too! It is so easy to go from the kitchen to this mini garden! It’s a working area… not just for “pretty”… it works hard for it’s keep!!! Can you see my old fashioned retractable laundry line? I use it almost every day! This part of my house is really busy with homekeeping duties!!! I’ve had my potting bench for 4 or 5 years. I got it for Mother’s day. It’s very basic and very very utilitarian!!! An old enameled wash basin as a sink and a spigot with running water. I keep the work area pretty clear because the veggies from the garden and the fruit from the trees stop here for a good cleaning before they go inside! I try to keep most of the mess here! The sour cherries are ready to be picked this weekend. This is where they will get a good cleaning! 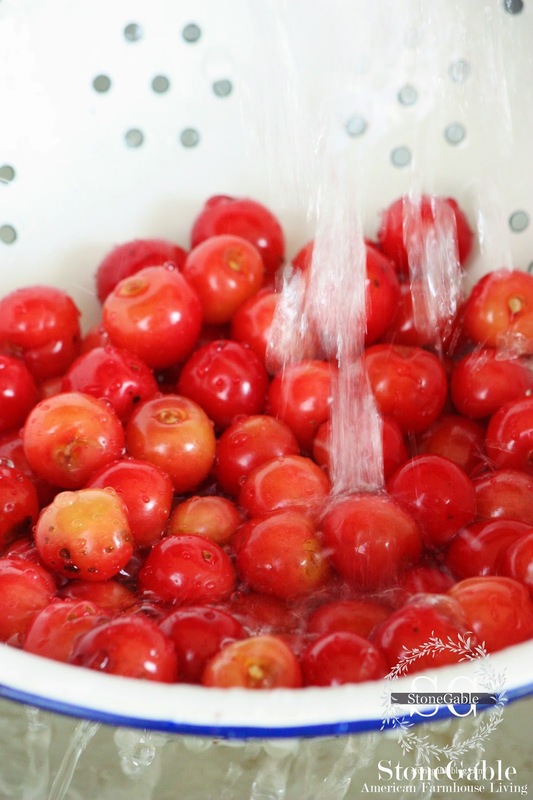 Here’s a picture of some of last year’s cherries getting washed at the bench! When I want to drain the water from the basin I do it the old fashioned way… I pick up the basin and throw the water out… usually watering the herbs! There is just something about this simple way of doing things that makes my heart sing! 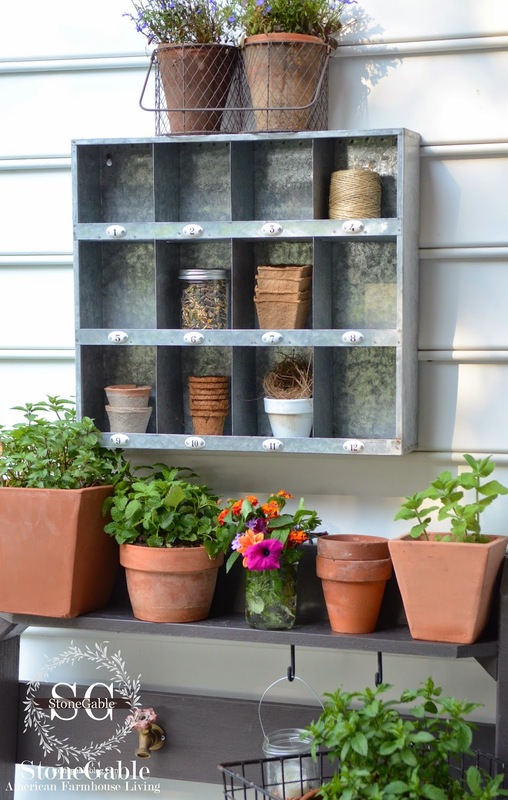 This year I found this great galvanized organizer at HomeGoods and put it to work holding little gardening odds and ends. It’s still a work in progress. I have to get a few garden tags, small stakes and old seed packets that I want to put in ball jars to keep in the organizer. Do you like mint? I love love love it! This year spearmint, peppermint and applemint are all potted on my bench! If you can get applemint it is fabulous in iced tea! Lemon balm and catnip are also planted in clay pots. My cat Hobbes is always at my feet and chattering to me when I am gardening. Cutting a little catnip for him will be such a big treat for his attentiveness! You are welcome, Hobbsie! 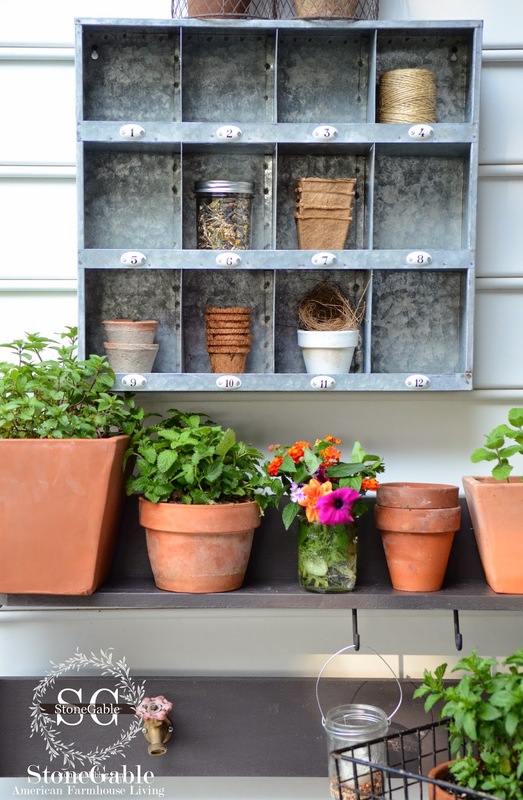 The bottom shelf of the bench holds extra pots, gardening tools, an old-watering-can-turned-planter and a bee skep. 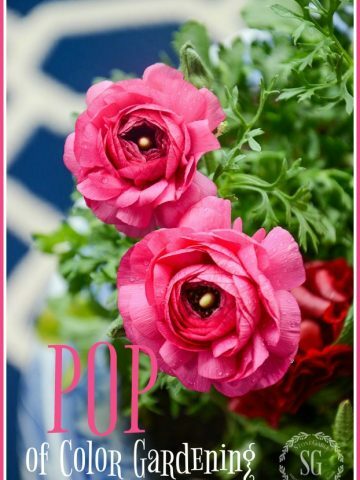 I found a wonderful way to keep potting soil on hand… I keep it in a small trash can! When I need to plant something I usually put the whole pot in the can and fill it from inside it! So much easier than lugging around a big plastic bag of soil when I need it! I recently picked up an old rusty metal stool. Gardening can be rough on the back… so sitting down while I’m at my potting bench really helps! And I love the idea of having a seat in this area! This year I moved my kitchen herb garden next to the bench! 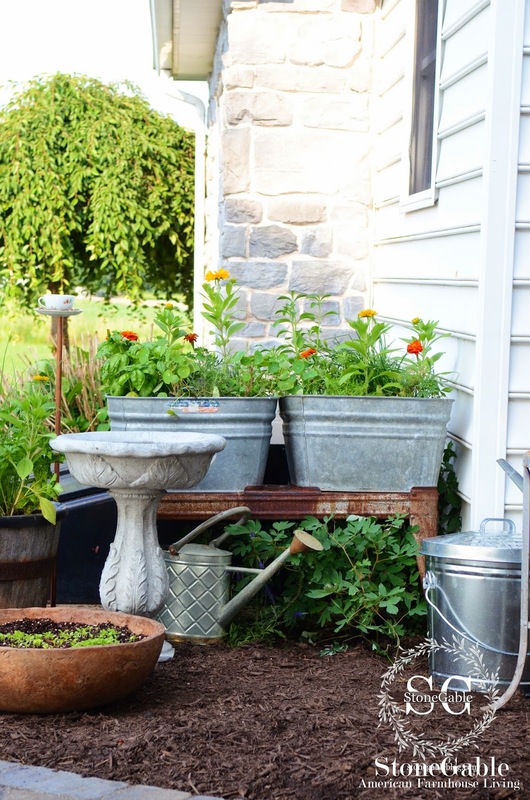 I found this fabulous old double wash tub at one of my favorite antique haunts early this spring (The Antique Village, Strasburg Pa) and repurposed it into an herb garden!! Herbs and marigolds and rubbeckia play so nicely together! 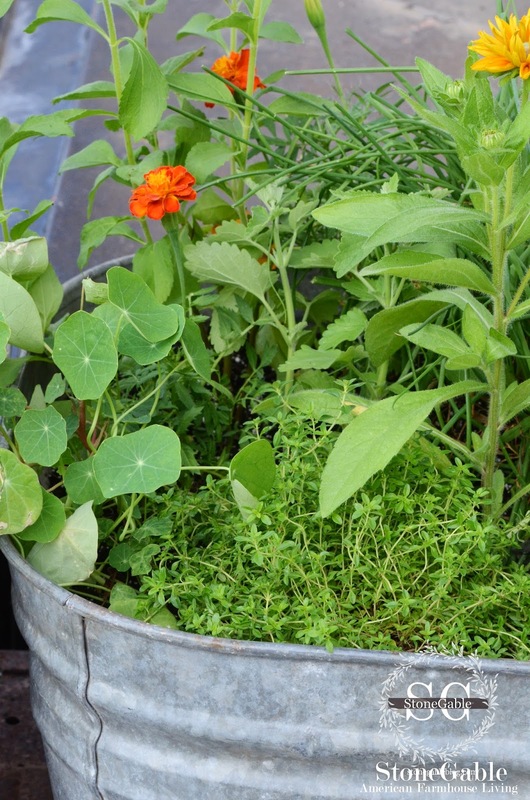 Do you mix herbs and annuals? I pick herbs like flower bouquets. They smell divine inside! The low, pottery bowl is literally a salad bowl. It’s getting too hot in my area to grow lettuce… it’s beginning to bolt. So I am keeping it in a cooler area near the house and hoping that I can have baby lettuce all summer long. We’ll see! Herbs will grow riotous throughout the summer and I’ll have to do lots and lots of clipping! Oh, joy! The leaves that look like little lily pads are nasturtiums. They are the most colorful edible flowers!!! So much fun to put these peppery flowers in salads. The old barrel is also filled to the brim with herbs… do you think I like herbs? Just a little? Not only are herbs and annuals welcome at StoneGable but so are local birds! Cardinals, blue birds, finches, red winged blackbirds, robins, mockingbirds and barn swallows are just a few that visit us daily. They sing from dawn till dusk and entertain us… so we give them something to eat and a place to take a bath in exchange! A mockingbird sits outside our weeping cherry tree and wakes us up everyday! Most mornings we love it’s enthusiastic song but some mornings we want to throw a shoe out the window at him! 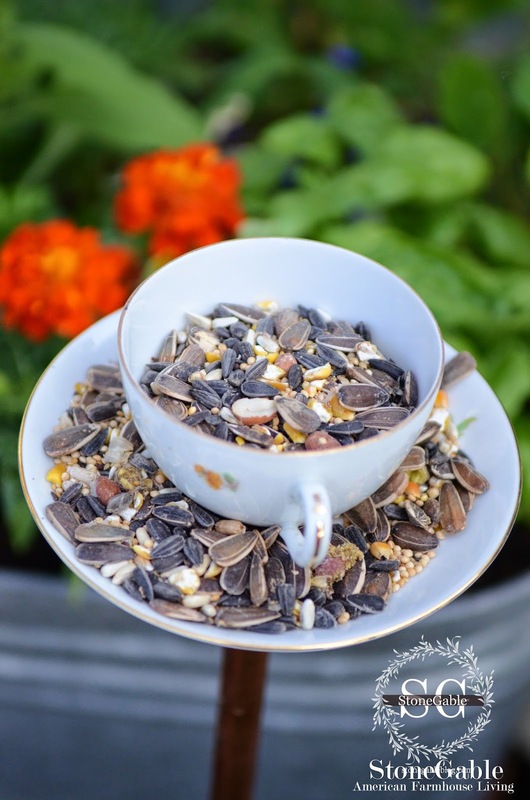 These easy to make CHINA CUP BIRD FEEDERS are fun and unexpected! I fill them daily. The bigger birds like doves and grackles don’t like to sit on the cups. 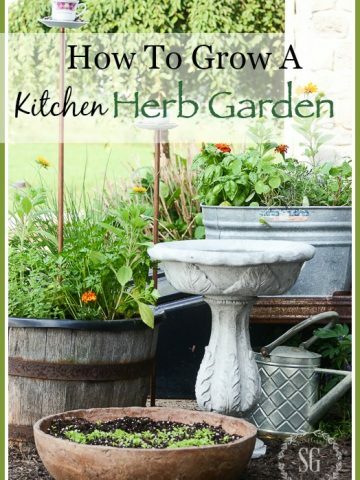 I hope you have enjoyed my little kitchen garden tour and have gotten some ideas you might like to use yourself! If you come to visit me at StoneGable and I don’t answer the door. Follow the walk around back… I’ll probably be be puttering at my potting bench or picking herbs for the kitchen! I’ll pick an extra bunch for you to take home after our visit! 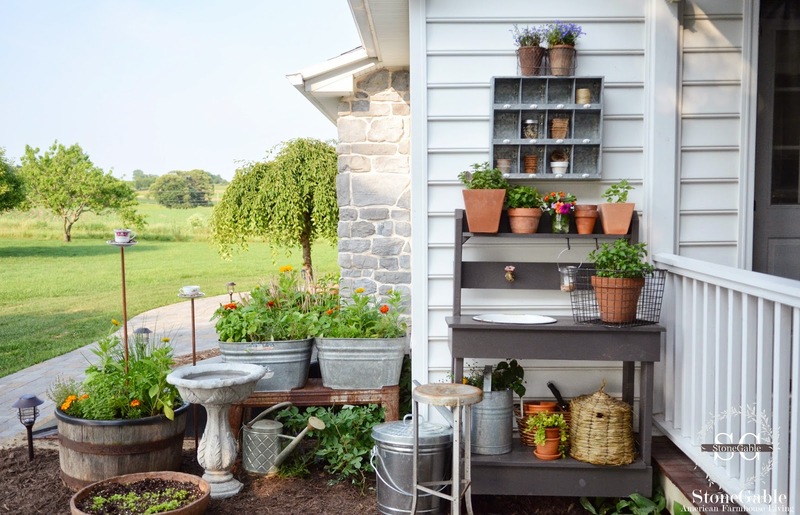 “Potting Bench and Kitchen Garden” very clever, perfect size and every thing you need handy in one area to care for herbs, fruit, and veggies! I am seeing another interest of yours. I too, love herbs in my cooking. They are also wonderful tucked into flower arrangements. I am a member of Garden Club since 1980. We love herbs and flowers. The TEA CUP bird feeders are adorable and the handsome Bird Bath with the leaf design. I’m sure your feathered friends love it too! Loved the article. Been ill most of summer. Is there any herb that is an annual? I have a box out back but would love to fill it with something. Any ideas? 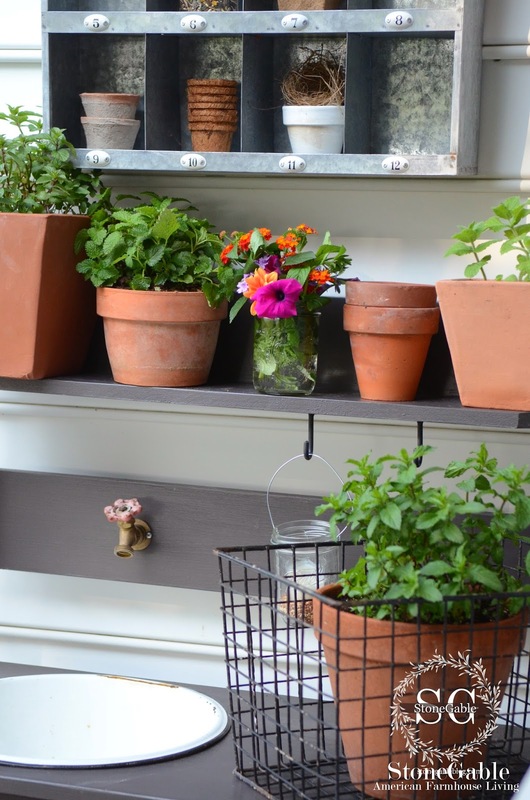 I love all the different heights of all the pretty and practical features of your potting bench and kitchen herb garden, as well as the cool, metallic finish on the galvanized pots! No wonder you are always creating such culinary delights, you have so much inspiration at your door! 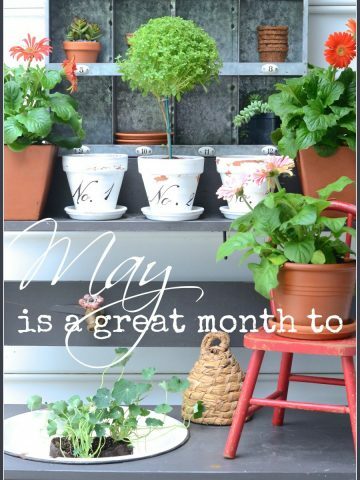 I love your herb garden – My mint is planted in the garden but I have other herbs in pots – the ones in the pots aren’t doing as well as the mint. My husband plans to move them to the garden too – hopefully, they’ll do better there. 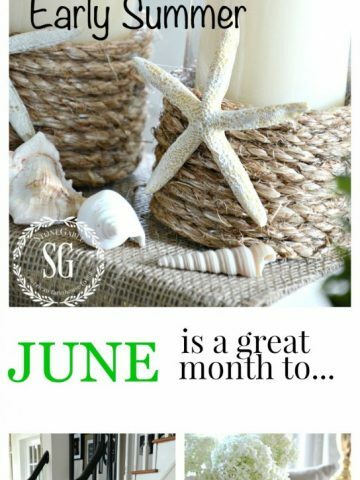 Just gorgeous and such an inspiring summer idea Yvonne! Love it Yvonne! Such a nice place to spend some time in your garden. Love the old tubs as well! Aren’t the 2 tubs used for water, shouldn’t that be the place you wash your veggies……..lol. wood in the middle. I am having the feeling the spigot and wash basin could cause damage to the house with the water and dirt splashing….how is that working for you? no problem. It rains and things don’t get damaged. So far, so good! Oh, Yvonne! I loved visiting your garden today. I so enjoyed looking through all your photos!! That little area around the back side of your house looks so peaceful. A wonderful place to putter around and enjoy a glass of lemonade or peach tea. As always, thanks so much for sharing . . . 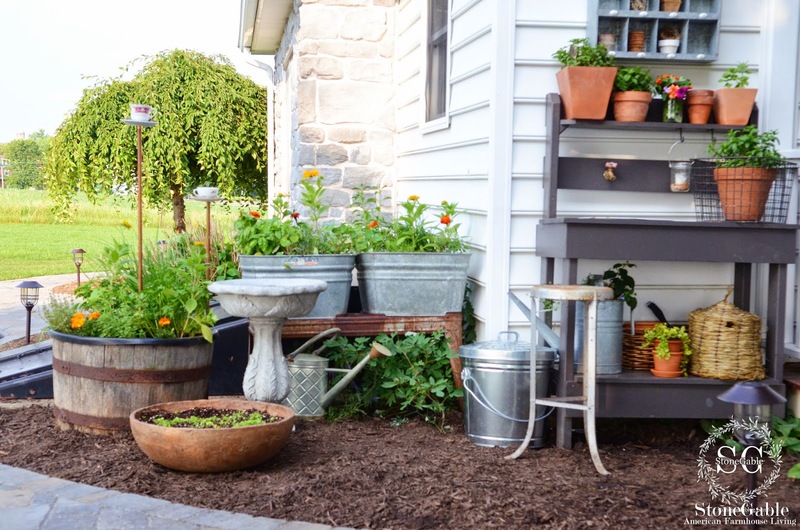 I love your potting bench by the porch. The sink with the spigot is perfect! That little corner is perfect for your herb garden. Love it! So pretty, practical and, well, PRETTY! (I was determined to get that alliteration in lol). Lots of good tips too Yvonne! I agree with Martha in the comment above…can I move to your house?? LOL! Seriously though Yvonne you have the magic touch my friend in everything from decorating to gardening to cooking. You are so creative and so talented and on top of it all just a truly lovely person inside and out! I’m blessed to call you friend! How lovely! I wanna move to your house…..
What a great area and everything is at your finger tips. Love your new addition of shelves that you got at Home Goods. Looks good. I love to sit in the garden in early morning and later in the evening so relaxing. 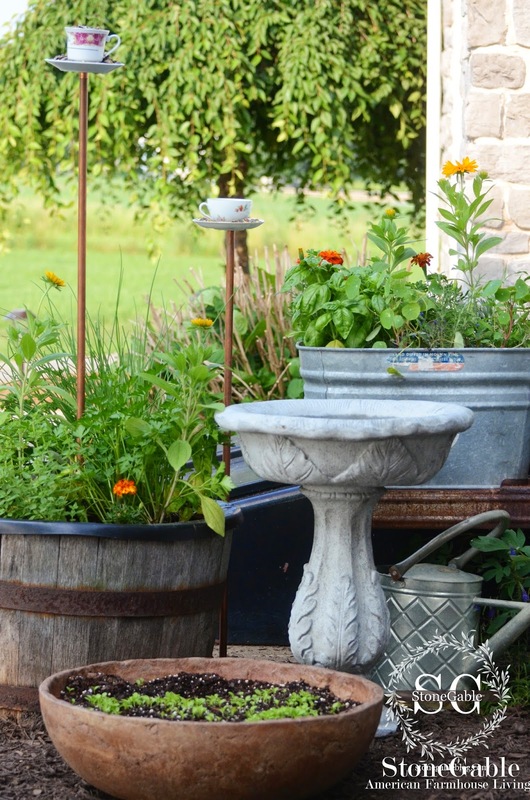 This is a beautiful area to have and I really like the use of all the large galvanized buckets. They add so much charm. The potting bench is so pretty and HG comes through again. I especially loved this post, Yvonne……thanks for sharing this hidden area of your house with us. You beautify everything you touch….even the potting area! Hi Yvonne, this is a lovely and practical thing to have at your home. I’ve set up a potting bench in my garage, (no water though), and love having it for the spring seedlings. Galvanized buckets are the best, aren’t they? Relatively easy to move around as needed because they’re so light. I love mint too and usually grow mine mixed in a huge broken pot which I’ve sunk into the vegetable garden. I love chocolate mint. Have you tried that one? No, Veronica. But it does sound like a very delicious combination! 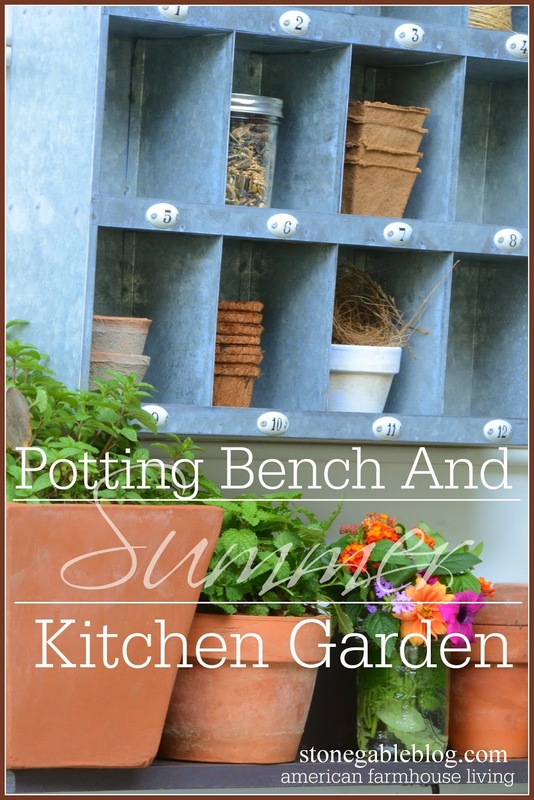 Oh how I love your potting bench and area!…and the most bucolic scenery that surrounds it!…I love the idea of the wash tubs serving as your herb garden!….so beautiful and functional…Can’t imagine having fresh cherries from your garden!…I so remember how nice the summers are in your area!!!.. What a sweet little spot Yvonne. N9wmypunhave 8nspired me to make a, pitcher of tea with mint. Lovely post Yvonne! I have to tell you that if the double wash tubs come up missing it means I snuck them away in the night. I want something like that SO bad. I have been looking on eBay but the shipping is so high. Hopefully I will run into one and can just load it in my car and tote it home. Enjoy your fun spot! There is another one at the same place I got mine! Just let me know and come on over for a visit Ann! Ann, I am already on the way to get that under the cover of night! Beautiful, Yvonne! I love your bench and adore that spigot and wash basin — so handy and cute! I adore puttering in the back yard with herbs, too. It’s definitely a summertime favorite. It gets a little hot here in TX so by mid July I’m a little over it but if I stick with it, I’m rewarded in the fall when the weather cools and things begin to flourish again. Thanks so much for sharing your beautiful backyard, Yvonne. I love having you on tour with us! 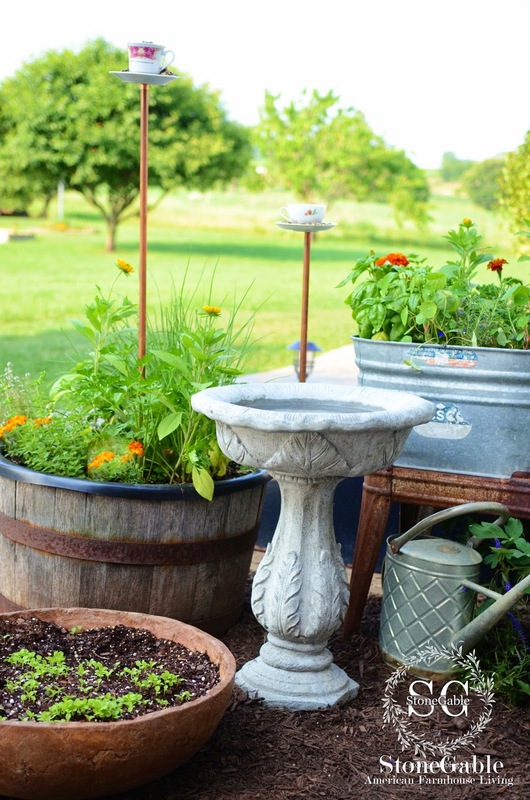 Great spot to enjoy your herb gardening…and I love the idea of the wash basin on the potting bench!! Happy gardening!! It’s fabulous! I love the wash basin idea. We just installed our potting bench this spring. So next year, I’m going to get a water line run out there. Unfortunately it’s at the back of the garage, so it will be a tricky job. But I know we can make it work somehow. What a wonderful spot to garden and watch the world go by. A potting bench is so handy, no more bending down. Just great. Just gorgeous..what a fun spot to while the summer days away in…so pretty! I love this spot, Yvonne. How nice to have a place close to the kitchen to snip some herbs. I’ve always wanted a potting bench. I love that little corner of your garden, Yvonne…it’s delightful! What a perfect spot to dig in the dirt…love it! 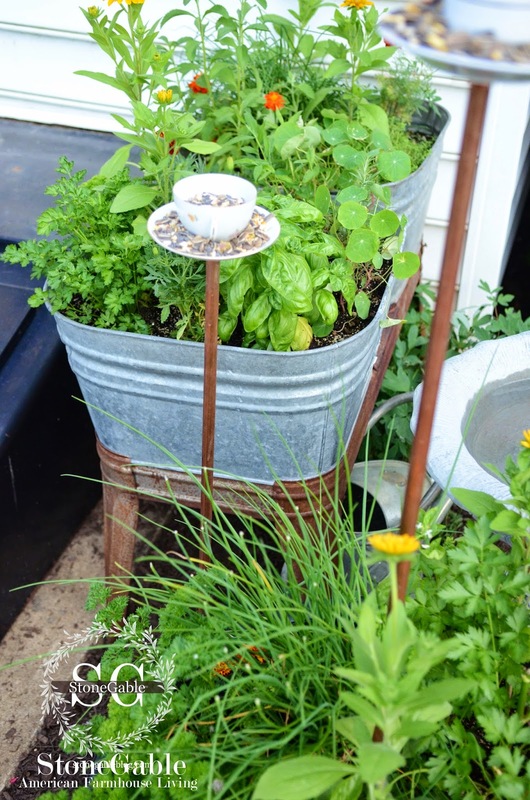 love your herb garden & potting bench, I have my herbs in pots on deck, so they are easily accessible. Lived in Lancaster many years and do miss it, although Williamsburg, Va. is a great place to live. Pretty! Wish I could have something like that too! However, live on a hill, and on a windy day, most of a display would be blown away . . .